Those individuals that really enjoy guns and that are interested in how they work, restoring them and bringing out their real beauty will want to consider gunsmithing school in order to make a living. This is a great way to make a living at something that you really love doing. The great thing is that there are a number of schools out there that are going to prepare you for a rewarding job with amazing skills. If you are interested in taking these types of courses you will most likely want to know what courses you will be expected to take while you are enrolled. This is great information to have as it can help you determine if this is the best program for you or not. So, let us consider what you will be expected to learn. One of the main courses that many programs will offer will be apprentice gunsmithing. This course is going to teach you gun safety as well as machine tools that you will need to learn how to use when working on guns. Metal refinishing and ballistics will be other courses that you may be expected to take. Engraving will also be a major course for you to take as well. What is interesting to know is that there are some programs that are going to offer you an associates degree. However, there are other programs that will simply give you a certificate. You must decide what you want to do with your education when you are finished to decide what type of a program you want to enter into. Other classes will include precision in rifle barreling. Many people are going to be very excited to take classes in milling and pistol design. Many programs are very intense and students are going to be learning more than they ever imagined. It is important to know that students will also be expected to take classes in entrepreneurship, operating small business and even in the principles of management. This is totally necessary if you are interested in opening your own gunsmithing shop one day. Many people do not think that they are going to need to take general coursework when they are entering into a program like gunsmithing. However, if you are going to run a business one day you will need to be prepared with computer skills and a sense of business as well. It may be a great idea to work with a gunsmith as an apprentice before you decide to open your own shop. In fact, many individuals may find it beneficial to do this while they are still in school. It is a great way to put the skills you are learning to use and to see how things are really done in the shop. This may be a great trade to learn if you enjoy working with firearms. It has been found that the average gunsmith has been in business for over 19 years. Therefore, if you decide to open your own business you will be creating a successful and long lasting business for yourself if you have the right education and knowledge. Get started with vocational gunsmithing schools and see what training programs. As the industry continues to grow the need for qualified gunsmiths are at a all-time high. Gunsmiths 30 years ago typically fixed guns that were simple where the gunsmiths of today have turned a hobby into a multi-million dollar industry. The guns of today are more advanced. Many states still allow fully automatic guns and semi-automatic guns that some never knew were possible to be built. Add to that the need for light scopes, lasers, lights and tactical add-ons and you’ll soon find out the industry has grown and the need for qualified gunsmiths is growing. The tools you’ll work with include bolt action pullers, vise blocks, swivel kits, different types of solvents and gels, headspace gauges and more. The tools you’ll work with and need will all depend on the different types of guns you’ll be working on. Gunsmiths that handle antique guns will need to know more about refinishing and preserving guns as well as gun cleaning where some of the guns might not be guns where the client actually fires it. Newer guns will more than likely need more maintenance due to the rigorous use. 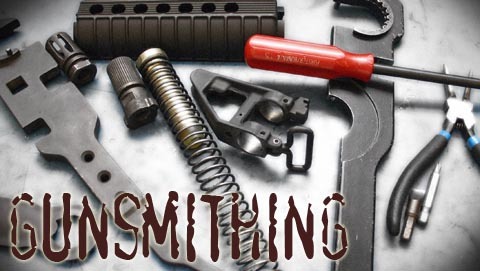 All different types of people take gunsmithing courses. If you just want to learn more about guns in order to properly maintain and fix your own guns then there are programs available just for that. You’ll still have the knowledge at that point to do more with your education. Many want to work out of their home and start their own gunsmith business. We recommend if you want to do that to look into getting your FFL license. The federal Firearm License. This license allows you to accept guns by mail in order to work on them. Without an FFL you’ll need to work out a deal with another FFL license holder so that any guns you receive will go directly through them. All states are different in regards to background checks and licensing fees to make sure to talk to the school you’ll be attending. If owning your own business isn’t your career goal then another option would be to work for a gun repair shop or a larger shop that sells guns that also does repair work. Many independent gun stores also repair guns. Having a wide range of gun knowledge regarding repair will be important as you’ll be working on different types of guns. Another option would be to work for a manufacture. Companies like Colt, Smith and Wesson, Stag Arms , Sig Sauer and Winchester are all major players in the gun business and all require trained gunsmiths and designers. During your training most schools start out with the basic framework of the gun and dive into metal finishing and metalwork. Some guns require welding where precision is a must. Guns also have different finishes so you’ll be taught the different ones, how to clean and even restore the finishes to new. You’ll cover gun safety and the proper way to dissemble and assemble all different types of firearms. Some schools offer certificate training where others have degrees in firearm technology. Modules can include handguns, rifles and shotguns and even ammunition. More advanced schools will have specialized programs that might cover AR-15’, advanced gunsmithing or specific handguns training.